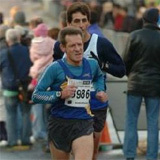 Challenge66: Chris joined Andy McMenemy on the first and last of 66 consecutive ultra marathons (50km). Andy, the son of a former soldier, established a new Guinness World Record for consecutive ultra marathons with no rest days. Chris' next Marathhon will be in Liverpool in October. I am a fully trained Personal Trainer covering Leeds and West Yorkshire. Then you'd love a massage. Other Areas of Expertise include: Nutrition, Aerobics, Circuits, Core Stability, Bodybuilding, Outdoor Work, Pre & Post Natal, Weight Management, Resistance Training. "I Googled sports’+’massage’+’leeds’ and the results came up with ‘Changing You’. A couple of years and many massages later I can safely say that nobody knows my legs better than Chris. 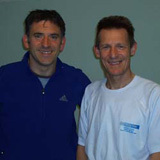 I’ve recommended Chris to a number of people looking for a sports masseur and can’t fault his technique, depth of knowledge or approach."